Little, Brown and Company, 9780316239837, 464pp. From #1 New York Times bestselling author Dr. Perlmutter, the devastating truth about the effects of wheat, sugar, and carbs on the brain, and a 4-week plan to achieve optimum health. 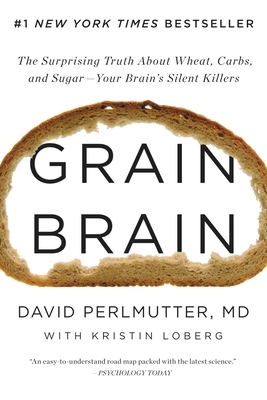 In Grain Brain, renowned neurologist David Perlmutter, MD, blows the lid off a finding that's been buried in medical literature for far too long: carbs are destroying your brain. Even so-called healthy carbs like whole grains can cause dementia, ADHD, anxiety, chronic headaches, depression, decreased libido, and much more. Groundbreaking and timely, Grain Brain shows that the fate of your brain is not in your genes, it's in the food you eat. Dr. Perlmutter explains what happens when your brain encounters common ingredients in fruit bowls and bread, how statins may be erasing your memory, why a diet high in "good fats" is ideal, and how to spur the growth of new brain cells at any age. And his revolutionary 4-week plan will show you how to keep your brain healthy and sharp while dramatically reducing your risk for debilitating neurological disease -- without drugs. Featuring a blend of cutting-edge research, real-life stories of transformation, and accessible, practical advice, Grain Brain teaches you how to take control of your "smart genes," regain wellness, and enjoy lifelong health and vitality. David Perlmutter, MD, is president of the Perlmutter Health Center in Naples, Florida, and the co-founder and president of The Perlmutter Brain Foundation. He is the recipient of numerous awards, including the Humanitarian of the Year Award from the American College of Nutrition and the Linus Pauling Award, and he serves on the Medical Advisory Board of The Dr. Oz Show. A frequent lecturer, he writes a blog at VanguardNeurologist.com and is a contributor to The Huffington Post. He is the author of The Better Brain Book, Raise a Smarter Child by Kindergarten, and Power Up Your Brain.